Delft conjures up images of pretty blue and white ceramics. Not murder in the castle, looting of Portuguese ships and 80 years of fighting the Spanish. But that’s exactly what I find when I visit it for a day. 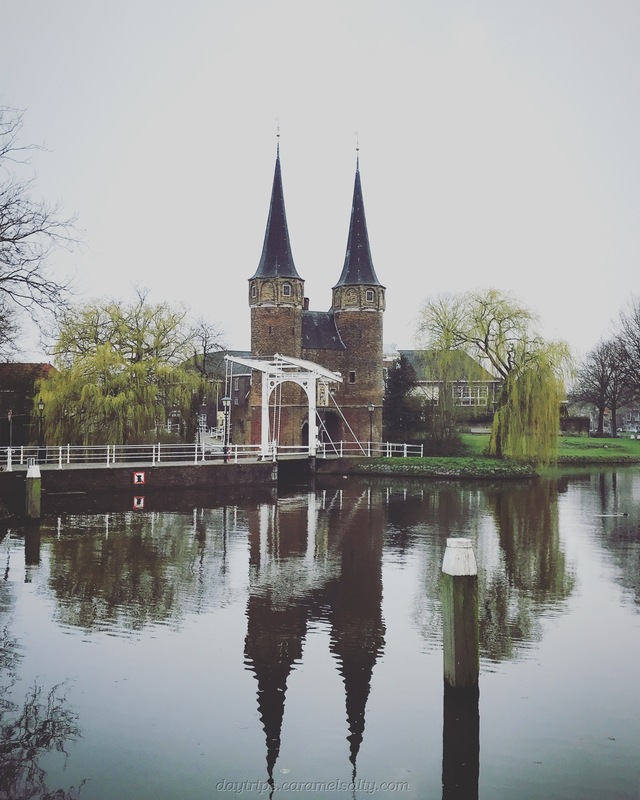 Despite being only 20 minutes away from the Hague, the tram journey to Delft yields some unexpected, but enjoyable, scenery. 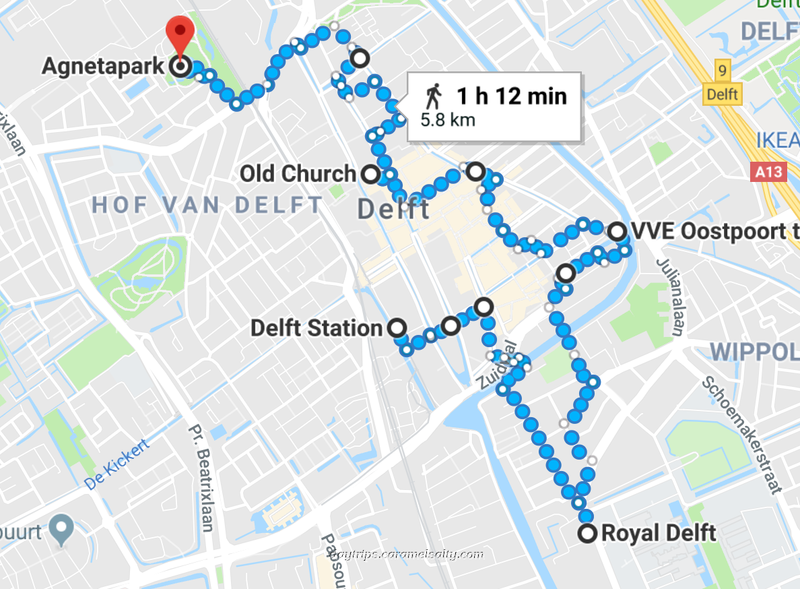 Once the tram crosses over the Zuidvliet canal, everything is suddenly greener, more spacious and tranquil as the tram ditches the road and hugs the canal to Delft Train Station, where I disembark. 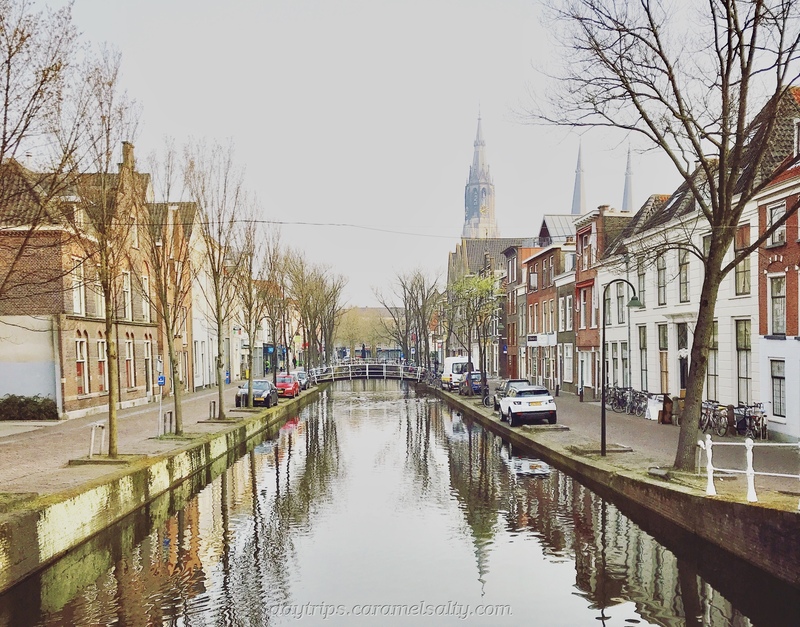 My first impression of Delft is of a laid back town, criss crossed by many canals, forded by pretty little bridges. The fairly recent decision to run the trains underground into the modern train station has contributed greatly to its general sense of serenity. The town itself hardly has any traffic either. 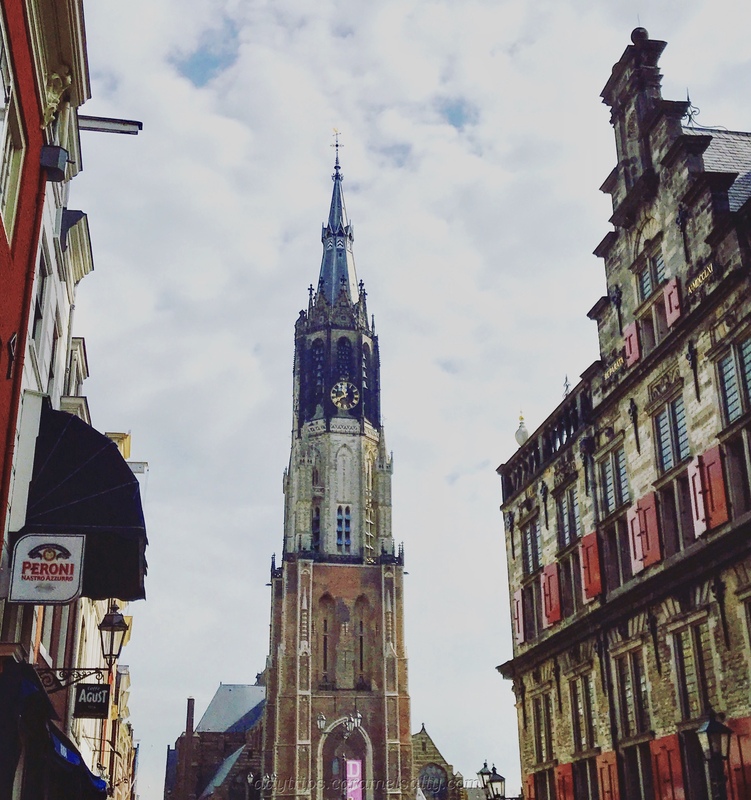 My story of Delft starts in 1246. Delft is the 40th village in the Netherlands to be granted City status. With this new-found position, it transforms from a rural village to a flourishing town. By the 15th century, it has defensive walls, eight gates and a surrounding moat. Today  Oostport (Eastern Gate) is the solitary gate standing from those days. It has been painted and sketched much in its lifetime. In the  Grote Markt, I find the Renaissance style  Stadhuis (architectural details here), originally built in 1618. Back in the 1300s only its belfry stands in the square. And so does the beggar Symons, in his usual spot, in the year 1351. Suddenly he gets a vision of the Madonna and a church. The result? A wooden chapel dedicated to St Ursula built in 1381 in the alleged spot of his vision. 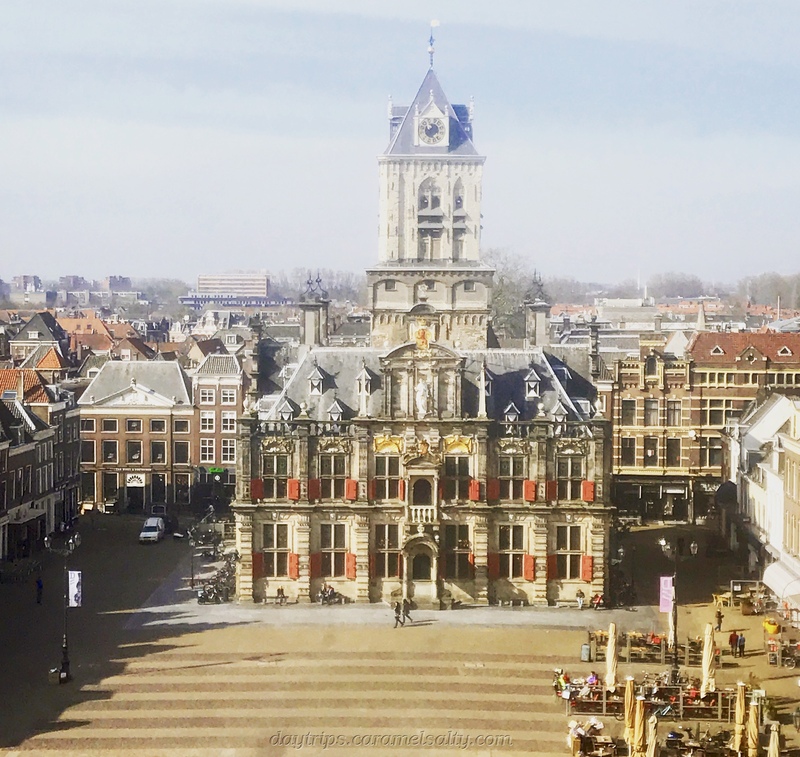 Today it’s the  Nieuwe Kerk, across the square from the Stadhuis. Nieuwe Kerk’s tower is completed in 1496. 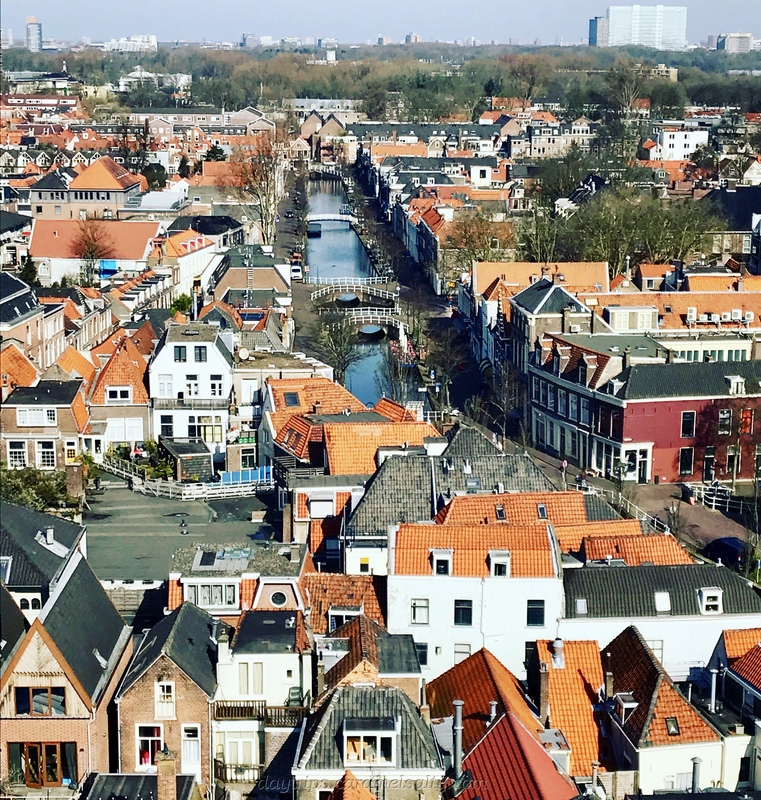 At 376 steps, it’s the second tallest in the Netherlands, which I climb for some great views of Delft. An obvious lightning magnet, it’s suspected of causing the devastating 1536 fire. As shown by this map, the fire destroys much of Delft, including the church. In 1555, Prince Phillip the II of Habsburg, King of Spain inherits the 17 Provinces of the Lowlands i.e. Holland and Belgium, when his father, Charles V, Emperor of the Roman Holy Empire, abdicates. And thus the Netherlands transfers from the rule of the Roman Holy Empire to the rule of Spain. 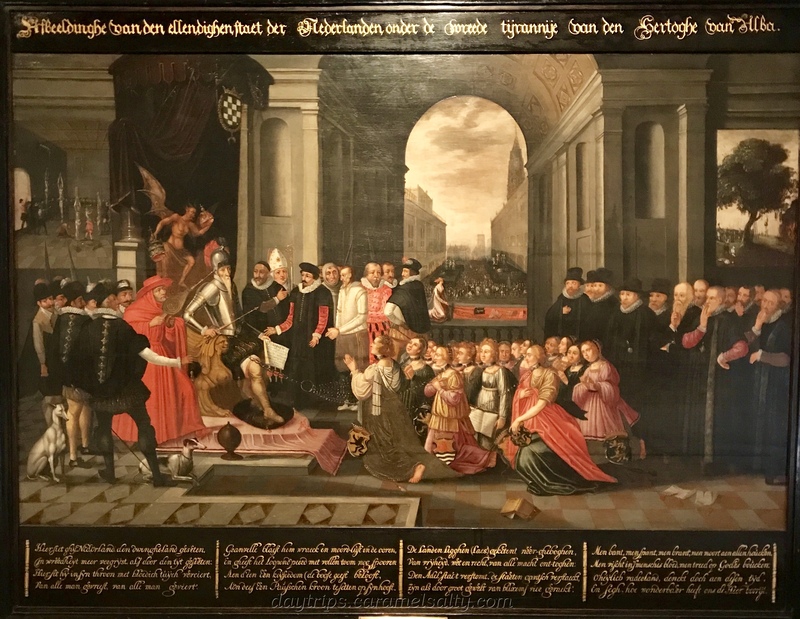 The story of how Holland transfers from the rule of the Duchy of Burgundy to the King of Spain is a common story of how fiefdoms get passed around through death amd marriage in Europe and Britain. And how it appears that most of the European Royal Family are related to each other. 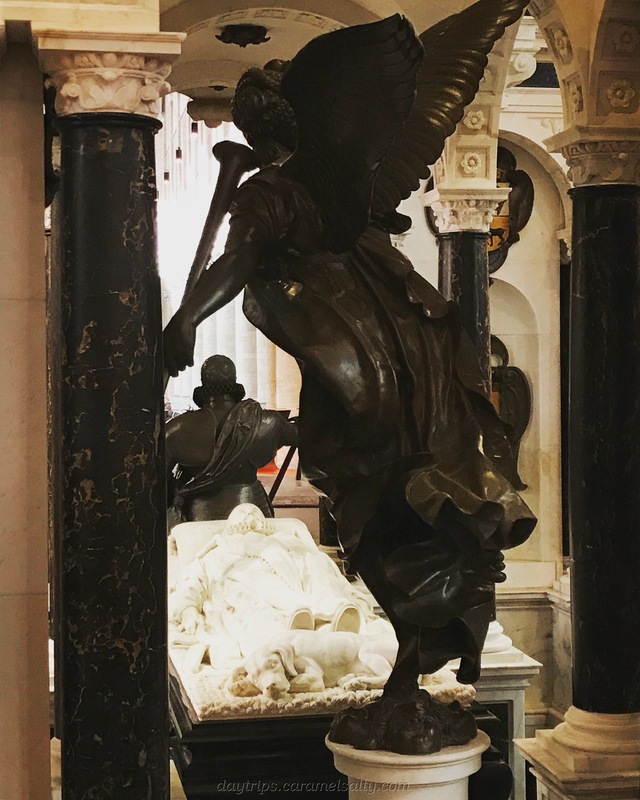 In 1566 iconoclasm (what is it?) erupts in Flanders. It’s the climax of the Protestant Reformation which started in 1517. This Beeldenstorm, as the Dutch call it, leaves a trail of destruction in the summer of 1566. 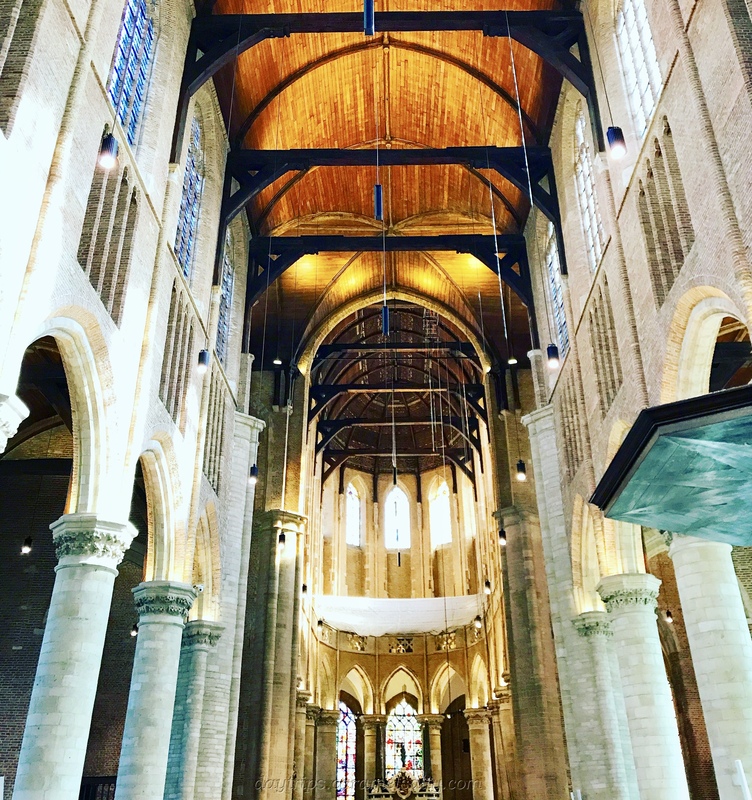 All bar one Catholic sculpture in the Nieuwe Kerk are destroyed. This explains why churches in the Netherlands have very plain interiors today. Philip the II takes his Catholic responsibilities seriously. He sends his agent, the Count of Alba, to set up the Council of Troubles that unlawfully and brutally deals with the Protestant heretics. It’s also an opportunity to remove any landed gentry who stood in the way of Phillip’s absolute power. One such landed gentry is William from the House of Orange. When his properties are seized, he resolves to free Holland from the Spanish. Thus begins the 80 Years War with Spain in 1568. With various initial successes, including the capture of Brielle in 1572 with the help of the Sea Beggars, he bases himself in the well defended city of Delft in the same year. The palace where William lived and worked in Delft is today the  Museum Prinsenhof. William works to unite the Low Countries behind him in his quest against the Spanish. There is a price on his head. In 1584, he is shot by a Spaniard, Balthasar Gerards, in the stairway of his palace. The bullet holes in the wall are still preserved. Balthasar Gerards is caught and tortured barbarically, even by the standards of the gory punishments conducted in those days. As William’s family crypt is in the town of Breda which is still under Spanish rule, William has to be buried in the Nieuwe Kerk. And since that day, it’s traditional for the Dutch Royal family to be buried here too. 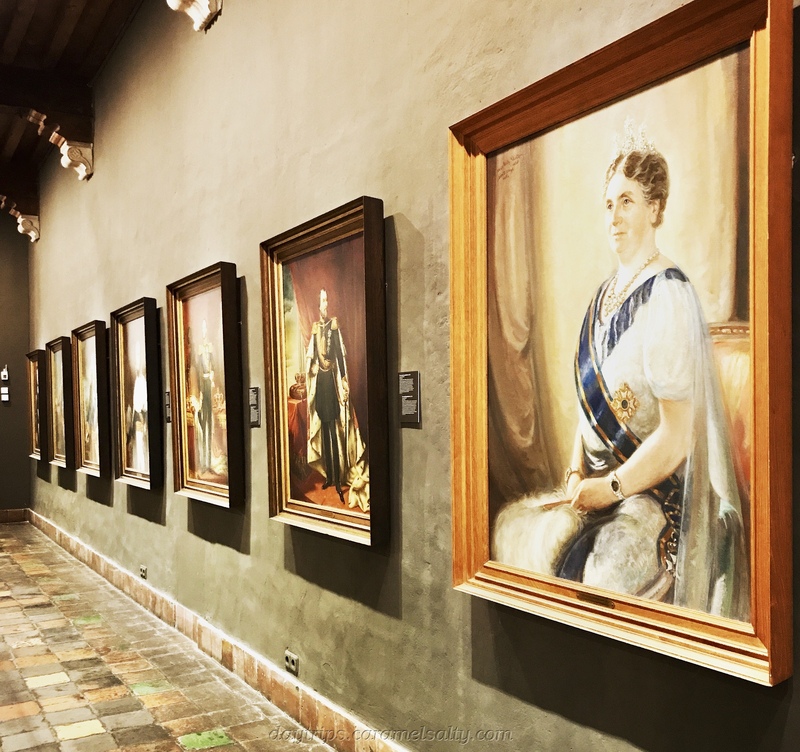 Royal portrait galleries are wonderful for instilling the order of succession. The gallery in the Prinsenhof is no exception. Maurits, William’s son, becomes stadtholder on his father’s death. It’s during Maurits’ rule that the Dutch East Indies Company (VOC) is formed in 1602, primarily by the efforts of Johan van Oldervanbelt. 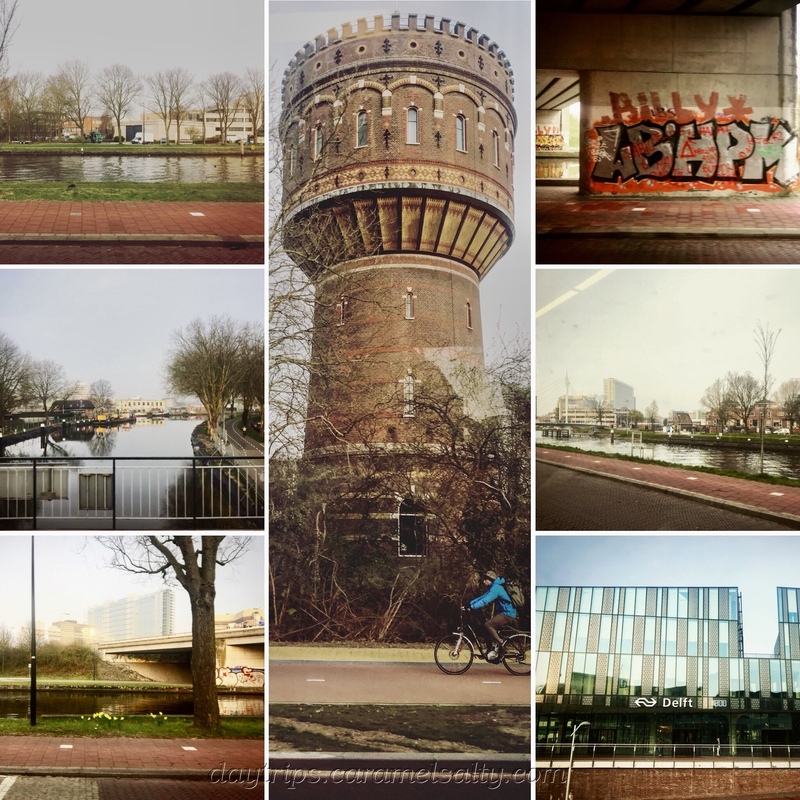 The story of Johan and Maurits unfolds in my Amersfoort visit. The VOC begins a trade war with the current East Indies trading powerhouse, the Portuguese. In 1603, the treasure laden Portuguese ship, Santa Catarina, is captured and looted by the VOC. 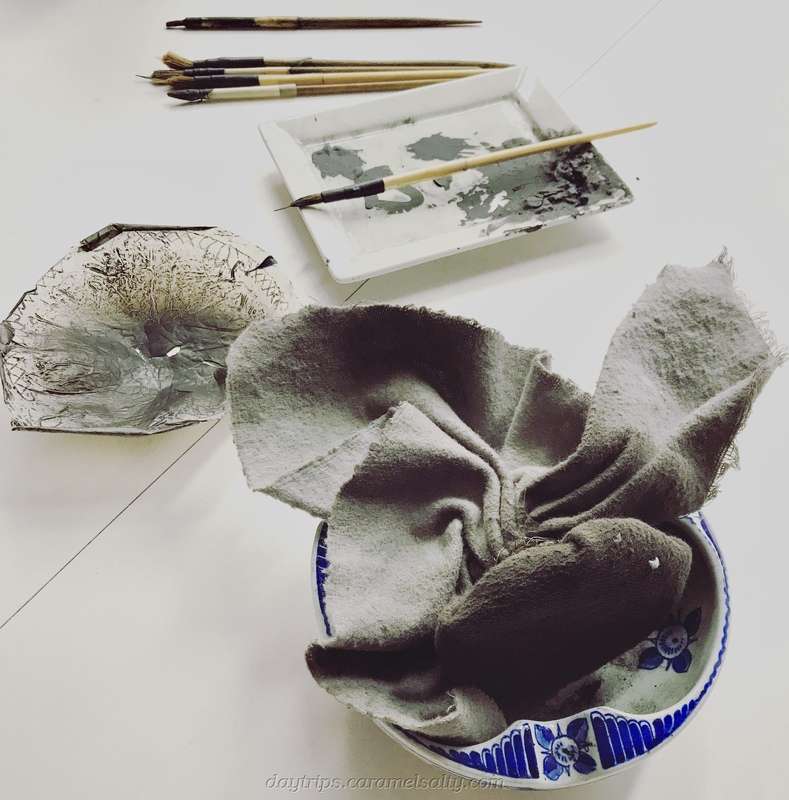 The high quality, beautiful blue and white Ming ceramics are auctioned off at considerable prices to appreciative Dutch audiences. The death of the Chinese emperor in 1620 disrupts supplies from China. This provides the impetus for the infant Dutch ceramic industry to step up to meet local demand. As I mooch around the cafes along the canals by the Nieuwe Kerk and its 16 awesome stained glass windows, I can still see its most famous mechanical clock (a scientific legacy of the Dutch to the world) from the cafe I’m sat at. 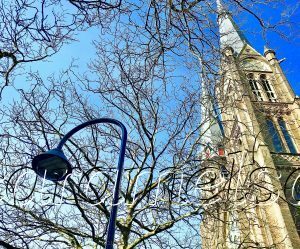 I think it’s carillon practice day today because all through my coffee break I am entertained by a continuous medley of songs, including the Sounds of Silence by Simon and Garfunkel. 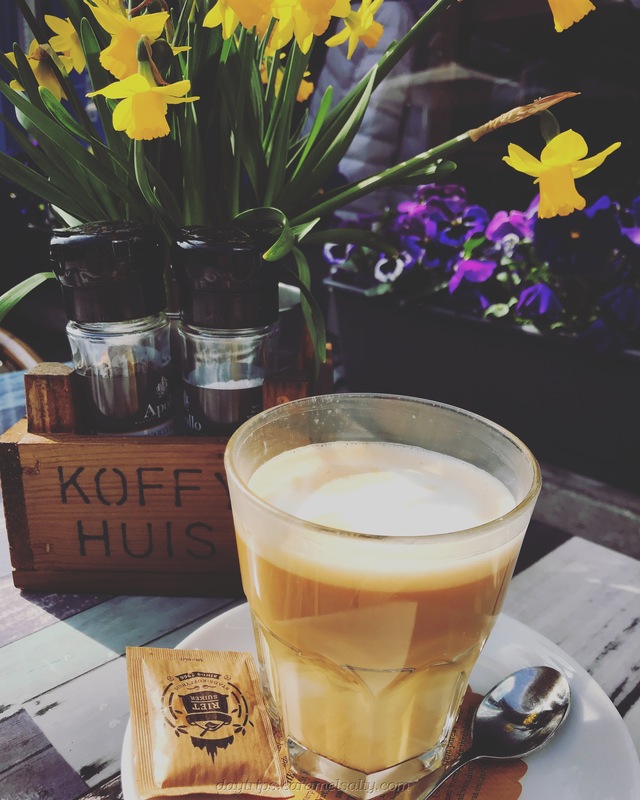 The tranquility of Delft certainly belies the fact that Delft, and the Hague next door, are centres from which so many wars are being waged in the 16th and 17th century. Do these wars ever end ? I wait to see this afternoon in Delft. 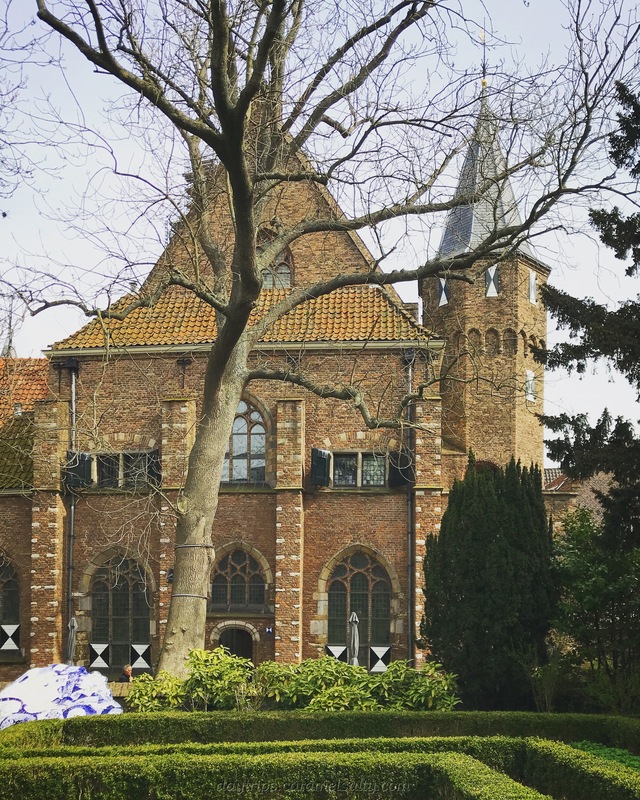 Amersfoort – Where Johan, Jacob and Piet Once Lived – to read the story of Maurits, the 2nd stadtholder of Holland and Johan van Olderbanvelt, founder of the VOC. 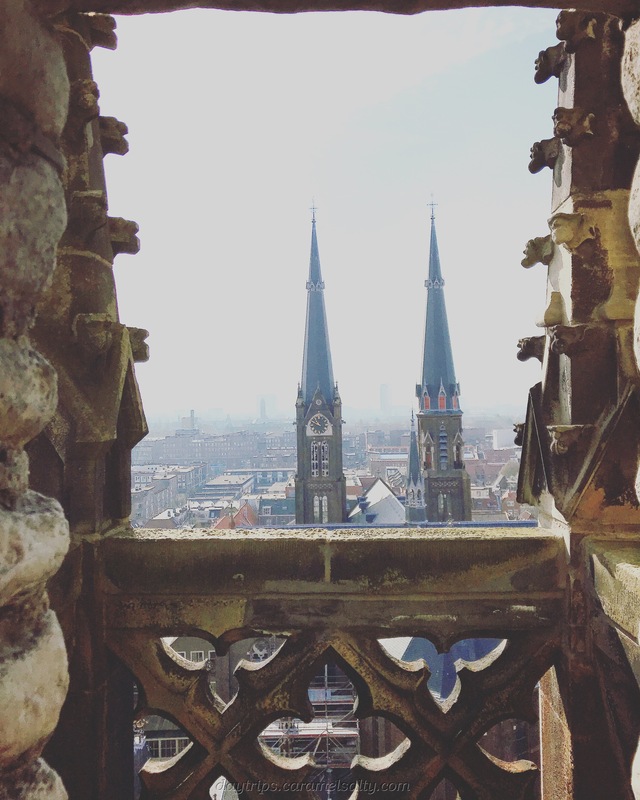 The Nieuwe Kerk Tower climb, whilst perfectly safe, can be nerve-wracking for those who suffer from vertigo. The climb up is on wooden planks on a spiral staircase. And the balconies are very narrow. Museum Prinsenhof (website) – open daily, free with the Dutch Museumcard.